For some time, we deliberated on creating an informational dashboard for our users, and we recently went ahead and implemented not just one, but two dashboards. 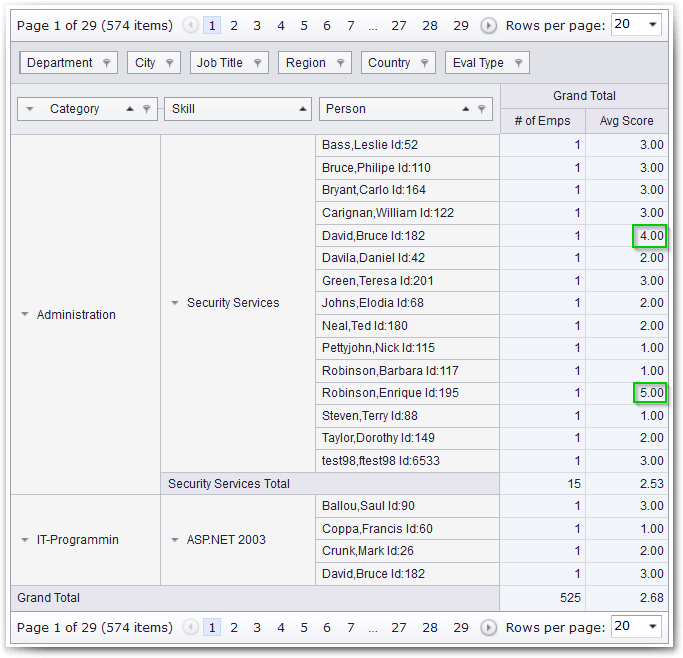 The first is the main dashboard which keeps you updated on your people’s skills and activity in the system. The two sections on the top left let you know how your people are using the system. On the first stat, you can see the number of people who are yet to add skills to their profile. The second stat shows you how many skills are updated each month, and with this data, you can decide if your people are active enough, or if you need to send out a notification reminding them to use the system. It may also help you keep track of employee development initiatives. If skills are not being developed, employees will have few or no skills to update, and this stat will drop. The “Top Skill Averages” section at the bottom helps you identify the skills for which your people are most competent. It brings this information out by displaying skills that at least 5 people have, for which the average score is at least 3 (Competent). The “Training Needs Analysis” stat on the right gives you a sneak preview of the skills for which your people need training. Further, we designed a dedicated Training Needs Analysis dashboard with which you can get more insight. We thought about it carefully and decided all the functionality needed for in-depth Training Needs Analysis could not be fitted into the Main Dashboard. Thus we chose to create a separate Training Needs Analysis dashboard. With this dashboard, you can create custom TNAs, unique to your requirements, and the needs of your company. 1. Quite a few employees have the skill. 2. The skill has a low skill score rating across employees. If there is a particular skill owned by quite a few people, this may indicate that the skill is important to the company. If you then find out the average score for this skill is less than “Competent”, it may be time to train. With our new TNA dashboard, you can find this out very easily. With the first section on top, you can ask the system to return skills that are owned by at least X number of people, for which the average score is less than Y. 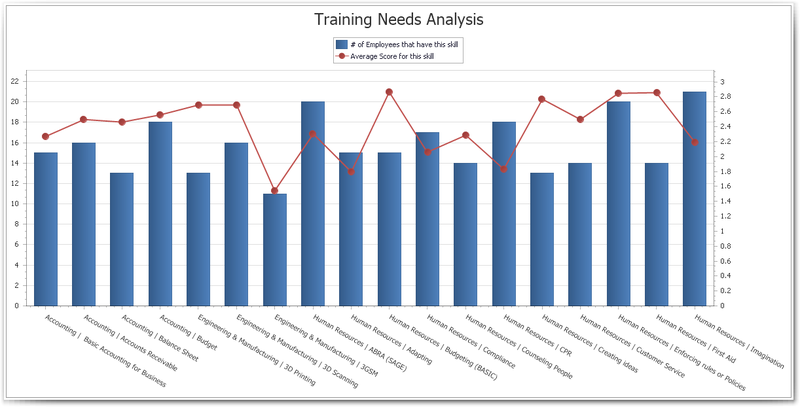 After specifying the values and hitting Refresh, the TNA graph refreshes to show you the results of your query, and from this graph, you can pick out skills for which your people need training (See TNA graph above for a sample). But it doesn’t stop there. Below the TNA graph, there is a simple report. If you drag the “Person” filter in front of “Skill” as shown in the picture below, the report shows you each individual who has the skill, and what their score is. With this information, you can select people to be trained, and people who are competent enough to handle the training. As you can also see in the picture, there are many other ways you can drill down on this data. If your company is spread out across multiple cities, you can add the city filter, etc. 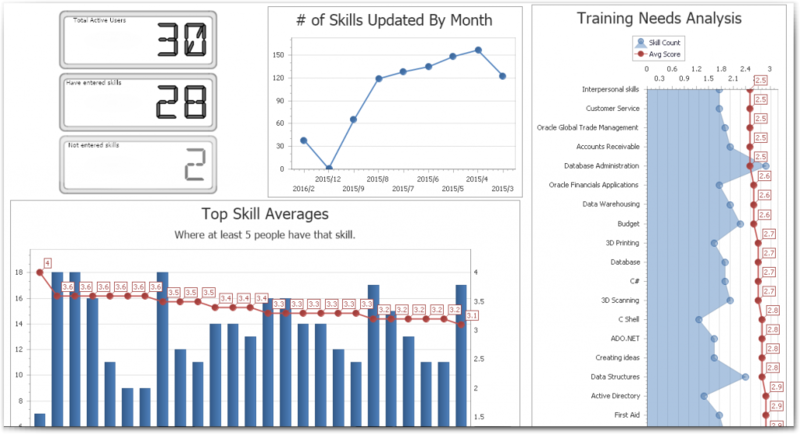 We hope by now some of you have taken our dashboards for a spin and have found out how they can give you insights into the activities and needs of your workforce. If you are yet to do this, this article has shown you ways in which this new feature can help you keep your workforce in top shape. Please take advantage of it and continue to reap the benefits of using Skills DB Pro to manage your workforce.